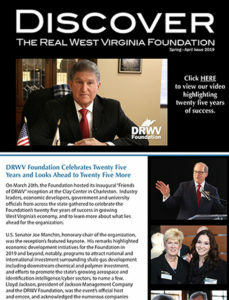 The Discover the Real West Virginia Foundation, Inc., is a private, non-profit 501(c) 3 organization with more than two decades of success diversifying West Virginia’s economy and providing West Virginia businesses with the resources they need to grow and succeed in today’s global economy. 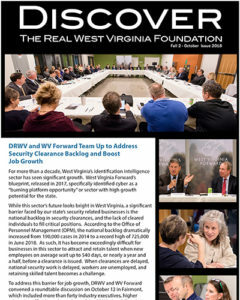 Featured Donors We would like to thank the following companies for their recent support of the Foundation and its efforts to build a stronger, more diversified economy for West Virginia! W. G. Yates & Sons Construction Company (Yates) is part of The Yates Companies, Inc. who ranks among the top construction services providers in the nation. With annual revenues of approximately $2 billion and over 8,500 employees, the firm has the capabilities to provide a full range of construction services to clients nationally and internationally. Yates has ranked among the top 50 construction service providers in all delivery methods (Construction Management, Program Management, General Contracting, and Design-Build) in recent years. These attributes make Yates one of the largest and most well respected corporations in the construction industry today. Operating throughout the country on a highly diversified construction program, Yates utilizes extensive self-performance capabilities including heavy, civil, concrete, masonry, electrical, mechanical, steel fabrication, asphalt/paving, security and utilities. These capabilities allow for more control over schedules and budgets on extremely fast-track projects. The company’s project experience is diverse in size and scope and encompasses an immense record of impressive projects. For more information, visit www.wgyates.com. Highmark Blue Cross Blue Shield West Virginia serves approximately 300,000 members through the company’s health care benefits business and hundreds of thousands of additional individuals through the BlueCard® program. Highmark Blue Cross Blue Shield of West Virginia holds the largest share of the commercial market, and more West Virginians carry a Blue Cross Blue Shield card than any other insurance carrier in the state. With offices in in Parkersburg, Charleston and Wheeling, it employs more than 700 people. Highmark West Virginia is an independent licensee of the Blue Cross and Blue Shield Association. For more information, visit www.highmark.com. IKM Architecture is a full service design professional firm that collaborates with organizations in workplace, education and healthcare market sectors to formulate a wide array of solutions that meet unique needs and make a difference in the lives of those that interact with each design. Offering comprehensive planning, architecture and interior design services IKM engages clients through an iterative, informed process utilizing a deep knowledge base that uncovers a thorough understanding of issues surrounding a project, explores multiple options, then decides on a solution that fits within the given parameters of each engagement. IKM, founded in 1911, is a regional architectural practice serving clients throughout West Virginia and its neighboring states using state of the art technology to assist clients in realizing their dreams. Hafer is a full-service design firm based in the Midwest with four decades of experience. We provide architecture, mechanical and electrical engineering, interior design and landscape architecture to a broad range of markets with specialties in healthcare, education and corporate. Our passion for creating spaces and environments always centers around the human element. And most importantly, we work hard to ensure our projects inspire people day after day.